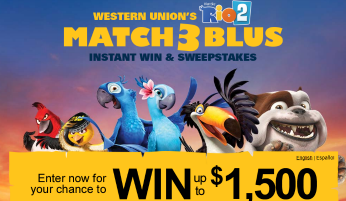 Western Union Match 3 Blus Instant Win & Sweepstakes – Win a Visa gift card! Win a Visa gift card (up to $1,500)! ENTER SWEEPSTAKES HERE – Western Union Sweepstakes page. ENTRY LIMIT – There is a limit of one (1) Game Play and one (1) Sweepstakes entry per Entrant per calendar day during the Promotion Period. ELIGIBILITY – This Promotion is only open to legal residents of the 50 United States and the District of Columbia, who are physically located within one of these states or the District of Columbia, and who are 18 years of age or older at the time of entry (having a valid Tax Identification Number (TIN) or Social Security Number (SSN). SWEEPSTAKES PERIOD – The Promotion starts on March 26, 2014 at 12:00 PM (noon) Eastern Time (“ET”) and ends on May 17, 2014 at 11:59:59 PM ET. The Sweepstakes Winner will receive at least a $500 Visa® Gift Card. If the Sweepstakes Winner entered the Promotion via one (1) of the methods set forth in Section 4A or 4B (regardless of whether that was the actual winning entry), then that Winner will receive a $1,000 Visa Gift Card. If the Sweepstakes Winner entered the Promotion via one (1) of the methods set forth in Section 4C or 4D (regardless of whether that was the actual winning entry), then that Winner will receive a $1,500 Visa Gift Card. ARV: Total ARV of the Sweepstakes Prize is up to $1,500.00. ENTER SWEEPSTAKES HERE – Schar Facebook page. Note: There are actually 3 sweepstakes running on the Schar page right now – be sure to check out all 3! You may enter all 3 at the same time. You could win some Schar products! ELIGIBILITY – This Sweepstakes is open only to legal residents of the continental United States and the District of Columbia, who at the time of entry are age 18 or older, and have a user account on Facebook. SWEEPSTAKES PERIOD – The Sweepstakes starts at 12:00 pm EST on March 25, 2014 and ends at 10:00am EST on April 30, 2014. PRIZES – Sweepstakes winner will receive a travel package consisting of the following described elements. All other aspects and expenses necessary for and relating to prize redemption shall be at the prize winner’s sole cost and expense. Prize winner and travel companion are responsible for valid passports and/or other necessary travel documentation to redeem the prize. A valid credit card will be required upon hotel check-in for incidental expenses. 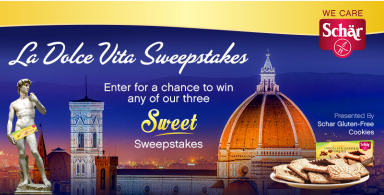 Prize package does NOT include airport transfers to/from prize winner’s home, from/to major airport closest to the prize winner’s home; airport transfers to/from Florence, Italy airport, from/to hotel; rental car; transportation expenses (including transportation to/from Chocolate Artisans of Florence Tour); meals; tourist activities; or incidental expenses. Prize package is limited to values set forth below. closest to the home of the winner (“ARV”: $2,000). – A four (4) night stay at a 4 star hotel in Florence, Italy (“ARV”: $1,600). Hotel will be chosen by Sponsor and its affiliates. Prize based on one (1) room, double occupancy. Total ARV of Sweepstakes Prize package to be awarded is $4,037.41. Trip must be fulfilled by December 31st, 2014. 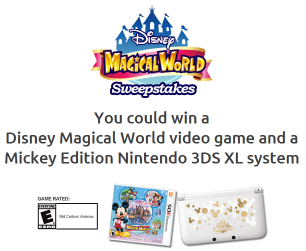 Disney Magical World Sweepstakes – Win a Mickey Edition Nintendo 3DS XL System & more! Win a Mickey Edition Nintendo 3DS XL and a Disney Magical World video game (5 winners)! ENTRY LIMIT – Entries are limited to one (1) Entry per person/Cell/email address per day (regardless of method of Entry or whether one person has more than one Cell/email address or more than one person uses the same Cell/email address). Maximum of 28 Entries allowed per person/Cell/email address during the Entry Period. ELIGIBILITY – Open only to persons, who are, as of the date of Entry, six (6) years of age or older, legal residents of, and physically located within, the 50 United States or D.C. SWEEPSTAKES PERIOD – You may enter this Sweepstakes in one (1) of two (2) ways during the period beginning at 12:01 A.M., March 31, 2014 and ending at 11:59:59 P.M., April 27, 2014. PRIZES – FIVE (5) GRAND PRIZES: Each winner will receive the following:  one (1)Mickey Edition Nintendo 3DS XL system, and  one (1) Disney Magical World video game. Approximate retail value (“ARV”) for Grand Prize: $229.98. Crate & Barrel $10,000 Pick Your Page Sweepstakes – Win Crate & Barrel products! Win all the Crate and Barrel furniture and furnishings featured on two facing pages of your choice in the Crate and Barrel Late Spring catalog! ENTER SWEEPSTAKES HERE – Crate & Barrel Sweepstakes page. ENTRY LIMIT – Limit one entry per person per day. Entrants may also garner one additional daily entry for each time the Entrant refers a friend who enters the sweepstakes by clicking through the refer-a-friend email and supplies a unique email address. Maximum of five (5) additional entries per day. ELIGIBILITY – The Crate and Barrel $10,000 Pick Your Page Sweepstakes is open only to residents of the 50 United States and the District of Columbia, who are the age of majority in their state or district of residence or older at the time of entry. SWEEPSTAKES PERIOD – Enter the sweepstakes between March 27, 2014 and 11:59 PM Central Time on April 20, 2014. 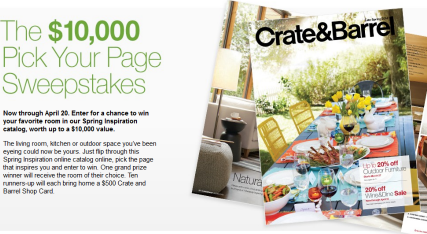 PRIZES – One (1) Grand Prize winner will receive all Crate and Barrel furniture and furnishings featured on two facing pages of their choice in the Crate and Barrel Late Spring catalog, up to an approximate retail value of $10,000. Value of each spread in the catalog varies. If the chosen spread is valued at more than $10,000, the Grand Prize winner may select items from the spread whose value totals $10,000. If the chosen spread is valued at less than $10,000, the winner will be given a Crate and Barrel Shop Card equal to the difference between the value of that spread and $10,000. If an item is not available, Crate and Barrel will provide merchandise or a Crate and Barrel Shop Card of greater or equal value. The Grand Prize includes shipping of all items included in the spread, which is not reflected in the $10,000 approximate retail value. Ten (10) other winners will receive a Crate and Barrel Shop Card worth (U.S.) $500. 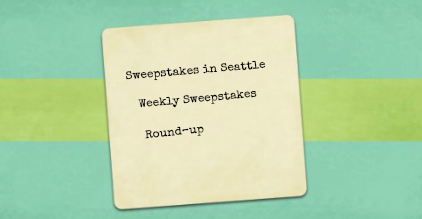 Sweepstakes in Seattle Weekly Round-Up 3/30 – Win 2 nights at Great Wolf Lodge, a trip to Hawaii, $50,000 & more! It’s almost April – can you believe it? March has just flown by for me. April 1st is my son’s 13th birthday! Happy Birthday, Ian! I will be offline all day Tuesday, but there will be new sweepstakes posted on the blog (I will try to share them on Facebook on Wednesday). Did you like the sweepstakes this last week? I thought there were some absolutely amazing prizes being offered! I’d love to hear if any of you have been winning – even if it’s a little prize! Remember, Sundays I will only post the weekly round-up so you can get caught up and see if you missed any of the sweepstakes posted during the past week. Have a great Sunday and check back tomorrow for new sweepstakes! I’ll also share winner’s stories here, so if you win a prize, let me know and you can be a part of the weekly round up! Serina won a FREE Reese’s candy coupon from the Reese’s IWG! DeAnn won a FREE Chocolate candy coupon from the Mars IWG! Hulu ”Best in Show” Sweepstakes – Win a 50″ Samsung TV & much more! Win a Samsung 50″ Smart TV, an Xbox One, a Tablet & one year of Hulu Plus! ENTER SWEEPSTAKES HERE – Hulu Sweepstakes page. ELIGIBILITY – Open to legal residents of the 50 United States and the District of Columbia, who are 18 years of age or older. SWEEPSTAKES PERIOD – Sweepstakes begins on March 13, 2014 at 12:00:01 a.m. Pacific Time (“PT”) and ends on April 10, 2014 at 11:59:59 p.m. PT. 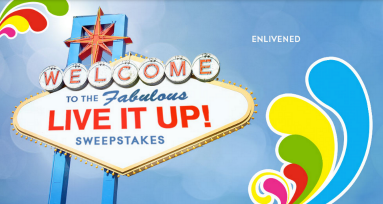 Glade “Live It Up” Sweepstakes – Win a trip to Las Vegas & more! Win a trip to Las Vegas, a $500 gift card & more! ENTER SWEEPSTAKES HERE – Glade Sweepstakes page. ELIGIBILITY – THE GLADE “LIVE IT UP” SWEEPSTAKES IS OPEN ONLY TO LEGAL RESIDENTS OF THE 50 UNITED STATES OR DISTRICT OF COLUMBIA (“D.C.”), WHO ARE 21 YEARS OF AGE OR OLDER AS OF THE DATE OF ENTRY. SWEEPSTAKES PERIOD – The Sweepstakes begins at 8:00:00 a.m. Central Standard Time (“CST”) on March 6, 2014 and ends at 11:59:59 p.m. Central Daylight Time (“CDT”) on April 30, 2014. PRIZES – Prize (1): A trip for winner and three (3) of winner’s guests to Las Vegas, Nevada. Trip consists of round-trip coach air transportation (from major airport near winner’s home within the U.S.) for winner and three (3) guests; double-occupancy standard hotel accommodations for winner and three (3) guests for two (2) nights (two  rooms); ground transportation to/from airport and hotel; four (4) tickets to one (1) concert at the House of Blues® Las Vegas during stay; four (4) VIP Foundation Room® passes the night of the concert; and a $500 pre-paid gift card. Approximate Retail Value: $5,000.00. ESPN The Sports Magic Sweepstakes – Win a trip to Walt Disney World & more! Win a trip for 4 to Walt Disney World, a $1,000 Disney Gift card & more! ENTER SWEEPSTAKES HERE – ESPN Sweepstakes page. You will need to sign into your Disney Go account. ENTRY LIMIT – There is a limit of one (1) entry per person/household/email address per day. ELIGIBILITY – The Sports Magic Sweepstakes is open to legal residents of the fifty (50) United States and the District of Columbia, who are eighteen (18) years of age or older, or the age of majority in their state of residence, whichever is older, at the time of entry. SWEEPSTAKES PERIOD – Enter the sweepstakes between 12:00 PM Eastern Time (“ET”) on 3/10/14 and 11:59 PM ET on 4/30/14. A trip for one (1) winner and three (3) guests to visit Walt Disney World® Resort near Orlando, Florida for four (4) nights. Trip includes the following: round-trip coach air transportation for four (4) between the major gateway airport closest to winner’s primary residence, as determined by Sponsor in its sole discretion, and the Orlando International Airport; four (4) round-trip ground transfers between the Orlando International Airport and the Walt Disney World® Resort via Disney’s Magical Express Service; room accommodations consisting of one (1) standard room (with a maximum of four (4) persons per room) for three (3) night(s) at a hotel at the Walt Disney World® Resort selected by Sponsor in its sole discretion (based on availability); one (1) night stay at the Cinderella Castle Suite in the Magic Kingdom® Park at Walt Disney World® Resort (subject to block out dates through February, 2016) with select food and beverage snacks and breakfast at Cinderella’s Royal Table; four (4) 5-Day Magic Your Way Tickets with Park Hopper® Option; one (1) Disney Gift Card with a value of $1,000; VIP viewing for one (1) Disney Theme Park parade or show for four (4) persons; one (1) Disney’s Magical Celebration In-Room decor in winner’s Walt Disney World® Resort hotel room; one (1) Welcome Basket in winner’s Walt Disney World® Resort hotel room; one (1) Richard Petty Driving Experience for winner and three (3) Richard Petty Ride-Along Experiences for winner’s guests (to participate, each guest must be 14 years of age or older and guests under 18 must be accompanied by a parent or legal guardian); one (1) tour of the ESPN Wide World of Sports Complex for four (4); one (1) Guided Fishing Excursion for four (4); and one (1) Parasailing Experience for four (4). Airline carrier and hotel regulations and conditions apply. Travel must be made through Sponsor’s agent and agent shall determine airline and flight itinerary in its sole discretion. Approximate Retail Value (“ARV”): $10,622.48. 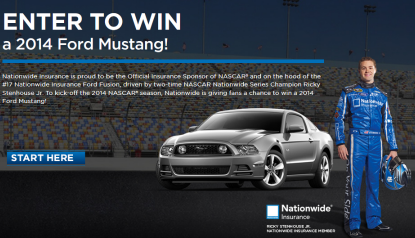 The ESPN/Nationwide 2014 Mustang Giveaway Sweepstakes – Win a 2014 Ford Mustang GT Coupe! Win a 2014 Ford Mustang GT Coupe! ENTER SWEEPSTAKES HERE – Nationwide Sweepstakes page. You will need to sign in with your ESPN/Disney Go account. ELIGIBILITY – The ESPN/Nationwide 2014 Mustang Giveaway (“Sweepstakes”) is open to legal residents of the fifty (50) United States and the District of Columbia (excluding New Hampshire), who are eighteen (18) years of age or older, or the age of majority in their state of residence, whichever is older, at the time of entry. SWEEPSTAKES PERIOD – Consumers will be eligible to participate between 12:00 PM Eastern Time (“ET”) on 2/20/14 and 11:59PM ET on 5/4/14. PRIZES – One (1) Grand Prize: A 2014 Ford Mustang GT Coupe. Approximate Retail Value (“ARV”): $30,000. The 2014 Ford Mustang GT Coupe ARV is based on 2014 MSRP of a base model. Grand Prize winner is responsible for vehicle registration, license, title and insurance fees and for all costs associated with any available upgrade/option packages and any other expenses related to the acceptance and use of the prize not specified herein. Win Garnier & Pottery Barn Teen products! ENTER SWEEPSTAKES HERE – Makeup.com Facebook page. ENTRY LIMIT – Limit one (1) entry per person, per email address for the duration of the Promotion Period. 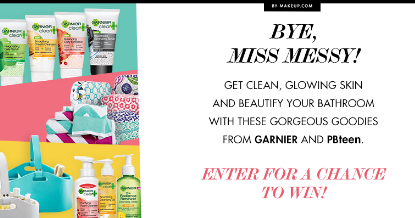 ELIGIBILITY – The Makeup.com MDC x Pottery Barn Teen “Be the Queen of Clean” Facebook Sign-Up Giveaway (the “Sweepstakes”) is open to legal residents of the fifty United States and the District of Columbia, who are at least eighteen (18) years of age as of the date of their entry. SWEEPSTAKES PERIOD – The Sweepstakes will begin at 8am Eastern Time (“ET”) on March 26th, 2014 and end at 5pm ET on March 31st, 2014. PRIZES – One (1) winner will be selected in the random drawing, where that winner will receive: One (1) Garnier Clean+ Invigorating Scrub, One (1) Garnier Clean+ Blackhead Eliminating Daily Scrub, One (1) Garnier Clean+ Shine Control Cleansing Gel, One (1) Garnier Clean+ Balancing Daily Exfoliator, One (1) Garnier Clean+ Purifying Foam Cleanser, One (1) Garnier Clean+ Nourishing Cleansing Oil, One (1) Garnier Clean+ Smoothing Cream Cleanser, One (1) Pottery Barn Teen Ella Beauty Caddy, One (1) Pottery Barn Teen Quilted Sleepover Toiletry Bag, Four (4) Pottery Barn Teen Large Chevron Print Bath Towel; ARV: $375.92.